NOTICE!!! As of Oct 18th American Classic Voyages, owner of the SS Indpendence, has filed Chapter 11 bankruptcy protection and has ceased all operations. This leaves the Hawaiian Islands without a regularly scheduled cruise line untill Dec 16th when Norwegian Cruise Lines begins operations in the Islands. 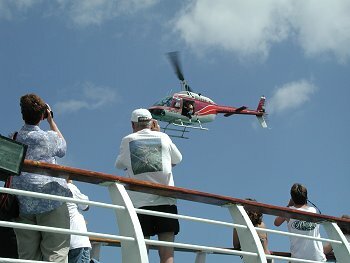 A wide variety of excursions are available in each port. 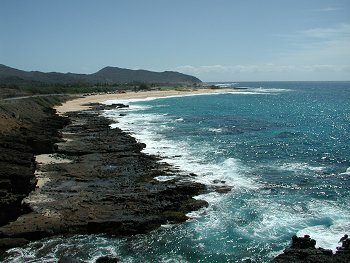 You can take the low impact route and enjoy a bus tour, or go on a more adventerous trip and snorkel, scuba, bike, etc. Be sure and review the shore excursion options before you arrive and book the ones you are most interested in when you arrive onboard. A few will fill up fast, but others you can book later, wait and see how your week is going.... Check with the excursions desk for details. We are joined at the pier by the private yacht Chamar and a Japanese fishing school/training vessel. 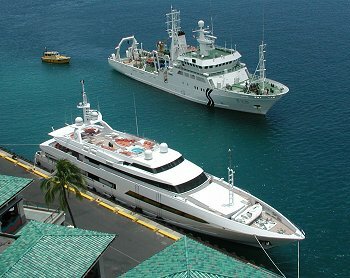 The Chamar is ranked the 81st largest yacht at 186 feet, owned by two brothers from London. SS Independence receives "Ship of the Year" award from the Steamship Association. Gentleman on the left is Bill Anonsen, a VP with American Classic Voyages the parent company of American Hawaii Cruises that runs the SS Independence. I asked him if the reduction in staff on shore will effect the on board experience of passengers. He responded that the reductions will make things more efficient.... I didn't have that much time with him, my Wife didn't like the fact that I was, once again, mixing my business with pleasure. This was supposed to be a vacation. 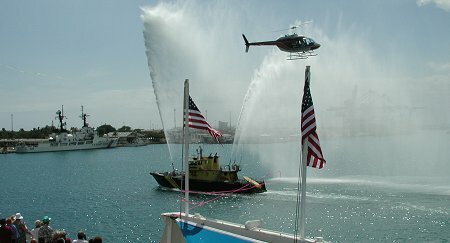 Helicopter drops flower petals over the ship as we depart Honolulu Harbor. My Wife is feeling better and works on her hula moves! 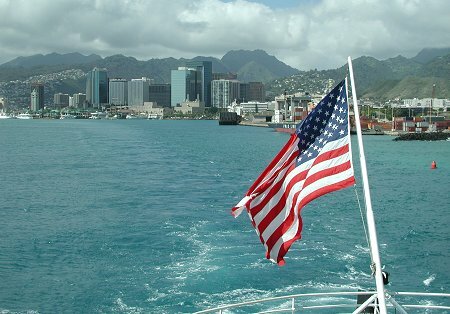 After leaving we moved up the coast and entered into Pearl Harbor. This is a rare honor for the SS Independence and is not part of a normal cruise. Admiral Raymond W. Burk (US Navy - Retired) spoke regarding his naval experience and his time on the USS Arizona. Photography of the military installations was not allowed. As we passed the USS Arizona Memorial a ceremony was held and flowers were tossed into the harbor. It is one thing to see it in the movies, another to actually be in the harbor and to see how the big warships were lined up on battleship row. 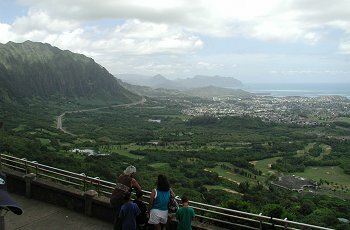 Kauai, Hawaii - Friday July 06, 2001 - Known as "The Garden Isle" this island is my favorite. I can't say much about a specific excursion because we bailed out and met some friends who were vacationing on the island. But the first place they took us was to have breakfast at a spot in the Anchor Cove Shopping Center. This the same spot that is serviced by a shuttle from the pier every 15 minutes. It has some shops (ABC Stores can be found all over the islands and offer good deals) and a great restaurant(lunch & dinner). Next to this shopping center is a very nice swimming beach. It was great, we ended up having lunch at one of the hotels along the water. If you want to have a great day on the beach this may be the best spot during the cruise. The harbor area at Kauai is very beautiful, a narrow harbor with steep mountains surrounding it. The narrow zig-zag entrance and the smaller harbor keeps the big mega ships out. Maui, Hawaii - Saturday July 07, 2001 - We arrive appx. 1 hour late into port. Last night we discovered that American Hawaii Cruises still has us down as leaving from the airport on one of their flights. This was corrected a month ago and their database is still screwed up!!! If we had followed their instructions our luggage would have been taken to the airport this morning, rather than held for our pickup at the pier. If you wanted you could have scheduled a shore excursion this morning and your luggage would be held for you at the pier. Final bill also arrived last night. We spent $562 on board. Neither of us drink so most of the charges were from the gift shop, photos, massage, and shore excursions. 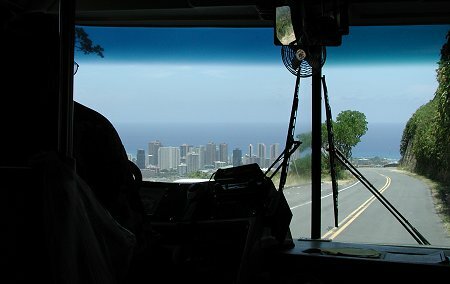 Cheapest excursion was the ride over to the Pearl Harbor memorial at $19 per person, most expensive was the Captain Zodiac snorkel trip at $75 per. WARNING: When it comes to who can board this ship while in port security is very lacking. Anyone with a blue piece of paper shaped like our boarding card could have walked right on. Nothing carried onto the boat was checked or given any amount of concern. I understand that we never left the United State while on this cruise, but I think people perceive a higher level of security when on a ship and easily drop their guards. People make friends with strangers quickly and give them a level of trust they normally wouldn't offer to those on shore. I'm not sure about the specific laws, but I'm suprised that I could have carried a gun, an explosive device, drugs or anything else I wanted onto the ship. The cruise industry has struggled for years due to the poor publicity resulting from crew members who have sexually assulted passengers. They should take extra steps in ensuring our safety. 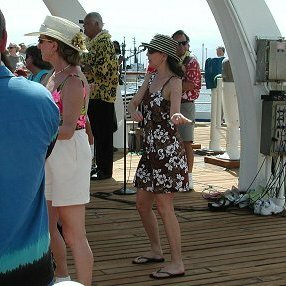 Evaluation: This cruise offers a reasonably priced option for someone who has never visited the islands. Take the cruise then return again in the future and spend more time at your favorite island. It also would be good for a family or large group looking for a reasonably priced vacation option. If you are looking for a classy ship this isn't it. In it's prime this ship carried royalty and celebrities, today it is showing it's age. 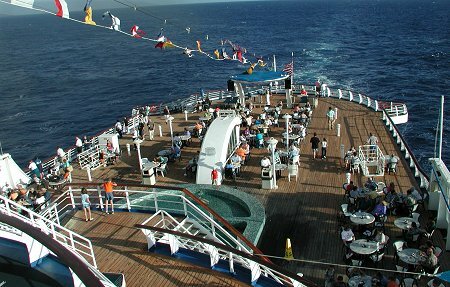 Decks are in poor shape and other visible signs of age takes the edge off of this cruise. If you want a high end experience, or a ship with all the modern conveniences like room service, you should wait for the December 2001 sailings of the new ship from Norwegian Cruise Lines. 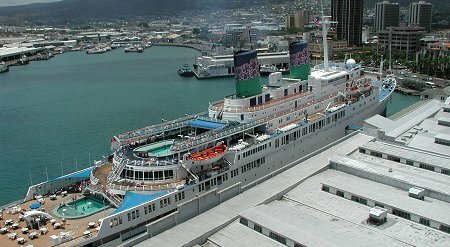 The Patriot, another American Classic Voyages vessel, also cruises the Hawaii islands but I am not familiar with it. I will research this ship and add additional info here when I find it. If it is managed the way this ship is I wouldn't expect much. It is Sunday as I am finishing this up. 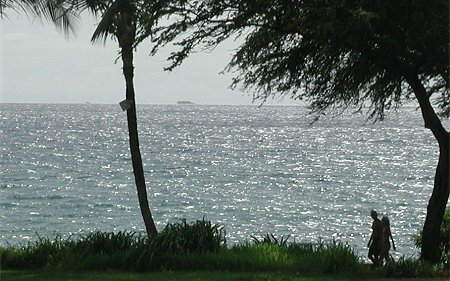 I sit with my laptop overlooking the ocean from our room at the Grand Wailea Resort on Maui. In the distance I see a ship... timing is about right... it could very well be the SS Independence.